There’s been build-up to this since forever, and we only get to see THREE Horsemen?! Aren’t there supposed to be FOUR?! Iceman was thinking it. I was thinking it, and you should be, too. They’re taking their good ‘ol time introducing Angel as Death, but it’s coming. Guess we have to wait a little longer. Still feeling the aftershocks of Fallen Angels, Hodge has sent Beast, Iceman, and Caliban on a hunt for Boom-Boom. Though things are a little fishy with Hodge, I can hardly doubt he got the Vanisher and his cronies to spawn some ill-conceived mini just for the sake of throwing folks off his tail, but we’ve got to blame someone. Anyhow, Iceman is skating all over the place so he won’t freeze up, and again they’re being chased by the cops. There’s an aside with Apocalypse and the Horsemen, fighting amongst themselves as to who the strongest is. Kind of sounds a bit like anti-disciples of Jesus. All wanting to be the best, but they need to work as a team to get the job done. Which is what happens. 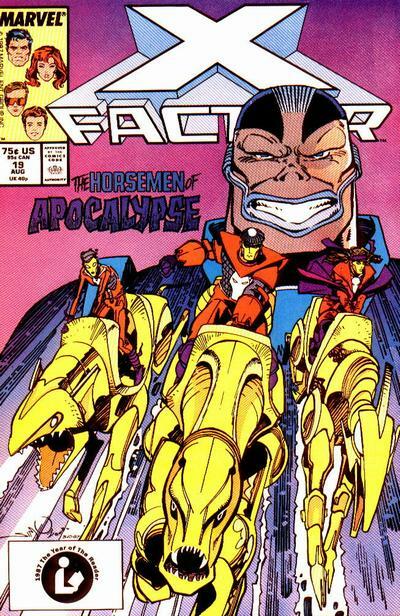 The Four Horsemen have it handed to them fighting these three alone, but once the rest of X-Factor shows up, there’s really no telling as to what they learn. How to lose? We’ll see if they figure how to fight as a team.